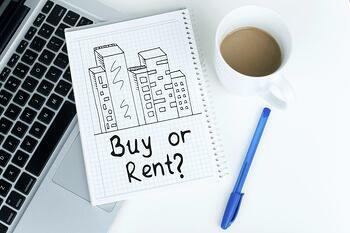 Deciding whether to buy or rent is one of the biggest financial decisions you will make in your lifetime. While there are several factors that go into this decision, here are some pros and cons for each that you may want to consider. > More Freedom: If you lose your job or end up hating the neighborhood, you can quickly pick-up and move to a new location that better suits your needs. > Build Credit: If you have a poor or little credit, renting is a great way to improve your score. By making consistent, on time rent payments, you can build or continue to raise your credit score. This will be especially helpful if you do eventually decide to apply for a mortgage in the future. > Bonus Amenities: Some apartment complexes offer bonuses to their tenants such as a pool, gym, outdoor entertaining space, and trash service which are already included in your rent. These are all things you will be responsible for once you own. > Rent Fluctuation: Your landlord can increase your rent each time your lease is up. That means, if your lease is month to month, you could deal with your rent changing every 30 days. > Limited Customizing: Any upgrades or improvements that you do make to a rental only benefit the owner of the property and you’ll see no return on that investment. > Landlord Rules: Even though you’re the one living there, you still have to follow the rules and regulations of the landlord such as whether or not pets are allowed, mandatory quiet hours, and garbage removal. > Builds Equity: Equity is the amount of the home that you own. It’s what you would walk away with when you sell your home and pay back the bank. When you rent, you are paying someone else’s mortgage and helping them increase their equity and you’ll have nothing to show for your time renting. > Tax Benefits: You can write off mortgage interest, property taxes, and up to $100,000 from home equity loans when tax time rolls around. These benefits are available for any type of home as long as you are the owner. > Fixed Payments: As stated above, your rent has the possibility of changing frequently. With a fixed-rate mortgage; you’ll know exactly how much you’ll be paying each month that you own the property. This makes it easier to create a monthly budget. > More Responsibility: As a renter, if a pipe bursts or the furnace goes out, you’d make a call to your landlord and the problem would be taken care of. Now, it’s up to you to take care of all of the maintenance around the house and any costs associated with them. > Unexpected Costs: You can do all of your homework and still come across expenses you didn’t plan for when you purchase a home. For example, property taxes are added on to your monthly mortgage payment, which you may not realize when you set up your budget. You’ll want to make sure you start saving money that’s specifically for home improvements or fixes. > Less Flexibility: When you rent, you are able to move quickly once your lease ends or you pay for early termination. It’s not as easy once you own. You will either have to sell your home or rent it out, both of which could potentially include additional stress, expenses, and aggravation. If you decide that buying is the right choice for you, Cyprus Credit Union is your mortgage partner. Our team of highly specialized mortgage advisors will take a look at your financial situation, help you find the loan option that works best for you, and then be there to assist you every step of the way. For more information and our current rates, you can check out our website & mortgage center or call (801) 260-7700.